THE scion of the Gandhi dynasty told Indians that the country’s “soul” was at stake on Thursday (11), as millions braved the hot sun to vote on day one of the world’s biggest election. Opinion polls put prime minister Narendra Modi as favourite to win, but he faces a possible backlash from India’s 900 million voters over unemployment and rural poverty. 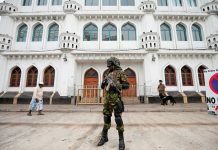 Because of India’s vastness, Thursday marked just the first of seven phases in the election to take place from the tea plantations of Darjeeling to the slums of Mumbai to the tropical Andaman Islands, and everywhere in between. Online too, a war rages with social media awash with disinformation, fake news, trolls and bots in what is Facebook and WhatsApp’s biggest market, where the world’s cheapest data tariffs have fuelled a smartphone boom. Polling stations in northeastern states like Arunachal Pradesh bordering China were the first to open, followed by parts of Bihar in the north — where women in multi-coloured saris queued — and Jammu and Kashmir in the Himalayas. 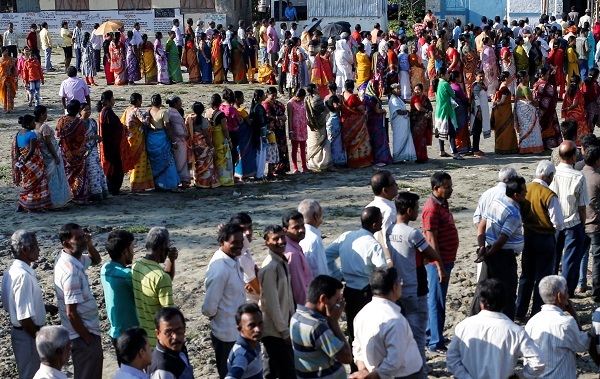 In Assam in the northeast, queues started forming 45 minutes before voting began, including many young people — there are 84 million first-time voters in this election — who were visibly excited. “It’s a great feeling to cast the vote, which makes me a part of the democratic system and makes me responsible for electing a good leader who can run the country,” Anurag Baruah, 23, told AFP. 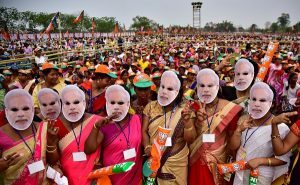 Supporter of India’s ruling Bharatiya Janata Party (BJP) wearing masks of prime minister Narendra Modi attend an election campaign rally. (Photo: REUTERS/Anuwar Hazarika). Critics say the BJP has since sought to impose a Hindu agenda on India, emboldening attacks on Muslims and low-caste Dalits trading in beef — cows are holy for Hindus — re-writing school textbooks and re-naming cities. Gandhi’s Congress party appeared in December last year to profit from voter dissatisfaction, winning three key state elections and chipping into the BJP’s Hindi-speaking northern heartland. “I want a government that thinks about women and brings down the high prices of rice and lentils,” Suman Sharman, 50, a housewife in Ghaziabad, told AFP. “Cooking gas prices have gone up, sending children to school is expensive. It’s difficult to run the household. I want the new government to think about middle classes,” she said. But Modi and the BJP’s formidable campaign juggernaut — the 68-year-old has been addressing three rallies a day in the campaign — will be no pushover, promising a $1.4-trillion infrastructure blitz. But perhaps crucially, India’s latest military altercation with arch-rival Pakistan in February has allowed Modi to portray himself as the “chowkidar” (“watchman”) protecting mother India. “Nationalism is our inspiration and inclusion and good governance is our mantra,” Modi, who even changed his Twitter handle to “Chowkidar Narendra Modi”, said at the launch of his manifesto.